Google Chrome web browser has a unique problem where its password saving feature is not working properly on some websites. Despite the options already been set to instruct Chrome to offer to save passwords, Google Chrome does not ask, offer, prompt nor show a yellow bar that allows user to save the password future future logins auto-fill. Websites that tag form elements with autocomplete = “Off” directive will not have passwords saved by web browser. However, there is an Chrome extension to override autocomplete tag to save passwords. Some users may have click on option that causing Chrome to never save password for the site. Follow the guide to undo and reset Chrome never save passwords exceptions list. However, sometimes, Google Chrome cannot and does not offer to save and remember a password entered on a website, despite the password can be saved and remembered in Firefox and/or Internet Explorer (IE) web browser. The unable to prompt to save password problem happens when users have enable offer to save passwords feature and no exception (never save the password) for the website in Chrome. Chrome simply does not show a prompt bar to save password for the logged in website. While developers work to fix the password saving issue (hopefully), here’s a workaround to get the password for websites that having issue saved in Google Chrome for automatic filling in on next visit. Run Firefox or Internet Explorer, and login to the website which Chrome does not offer to remember password. 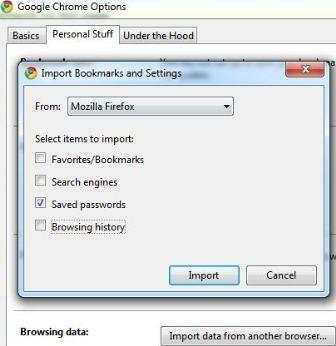 After logged in, save the password in Firefox or Internet Explorer (click Yes when prompted to save password). In Google Chrome, click on Wrench icon, and select Options. Click on Import data from another browser button under “Browsing data” section. Select and tick the check box for Saved passwords only. Unselect and untick all other check boxes (unless user requires them). In the “From” drop down box, select Internet Explorer or Firefox according to where you saved the password. Once import is done, user can use Google Chrome to visit the website which Chrome originally won’t offer to save password, and now the user name and password will be auto-filled.